The Gunpowder River is a little off color and is flowing at 90 CFs and is 48 F. Wild trout have been taking nymphs in the #18-22 range in the flat water. Large streamers fished in and around the bend pools and log jams are a safe bet. 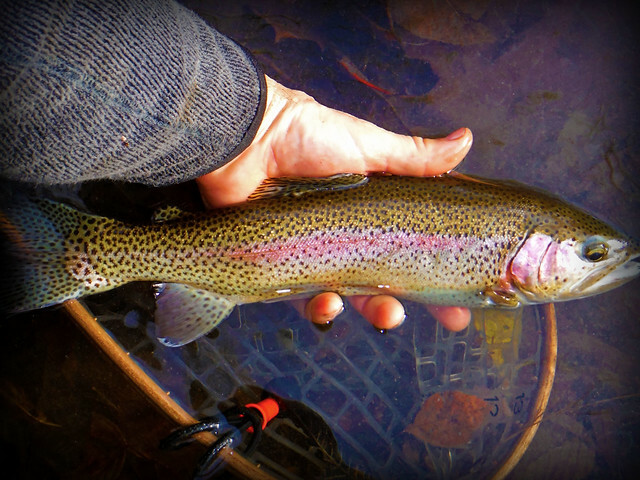 The boulder pools have been tough to fish (read slippery) during frosty mornings so be careful out there! A few early brown stoneflies were reported today so if you have any dark caddis in your box give them a try. If you need some flies, advice or just need to get away from those pesky relatives, please consider finding us on the Shop Small® Map and joining us for Small Business Saturday. First you need to register your AMEX at www.shopsmall.com . It’s an easy form-just fill out your Name, Card # and email. When you use your card and spend $10 or more Saturday, November 29 at Backwater Angler and you’ll receive a $10 statement credit. If you find two other small business also taking part in this offer and spend another $10 at each location you will receive up to $30 total in statement credits within 90 days.Why shop locally rather than online? Simply put your money goes further when you shop local independently owned shops such as Backwater Angler. “Multiple studies from civiceconomics.com show locally-owned independent retailers return more than three times as much money per dollar of sales to the local economy than chain competitors and buying remotely on the web creates almost no local benefit–just a few minutes’ work for a delivery person that likely won’t be able to help you with directions to the River or tell you what flies are working. For the past 13 years your patronage has helped Backwater Angler support five staff members, five guides and the local community including donations to the Boy and Girl Scouts, Potomac Patuxent, National Capital Maryland and Mid Atlantic Council of Trout Unlimited, Gunpowder RIVERKEEPER, Coastal Conservation Association, WATERKEEPERS Chesapeake, Maryland Horse Breeders Association, Ducks Unlimited, Center Stage, Hereford Food Bank, Hereford Robotics Club and the Hereford Fall Fest benefiting the Hereford Volunteer Fire Department. Thanks for your support-We hope to see or hear from you tomorrow. This entry was posted in fishing report, news on November 28, 2014 by Theaux Le Gardeur. The Gunpowder River is clear, flowing at 50 Cfs and 48.5 degrees F. I find it hard to believe that by Monday folks are talking about a 69 F day leading up to Thanksgiving! Thanks to Stephen Knott for another nice shot-this time of a stocky caught on a big streamer. This fish likely held over during an early stocking, moved up from the lower River and is now taking on some beautiful colors. Stop in this weekend and spend some time picking up stonefly nymphs and dries out of the muffin tins. It’s not too early to swing some soft hackles stonefly and nymph patterns in the shallows. With the wind lessening this weekend, plan on seeing a few tiny BWO’s in the flats between York Rd and Falls Rd. We just received some lovely Blue Winged Olives sized down to a #26 but a parachute in a size #18-20 should work fine. We’re faced with relatively low water this time of year-that said streamers are always a good bet. To slow roll sculpin patterns effectively-Be sure to add just two or three feet of 4x to an Airflo sinking polyleader to get the big flies down fast and twitch them abruptly while they sink down into the boulder pools. Please note: The shop will be closed this Wednesday and Thursday for the Thanksgiving Holiday. This entry was posted in fishing report on November 21, 2014 by Theaux Le Gardeur. 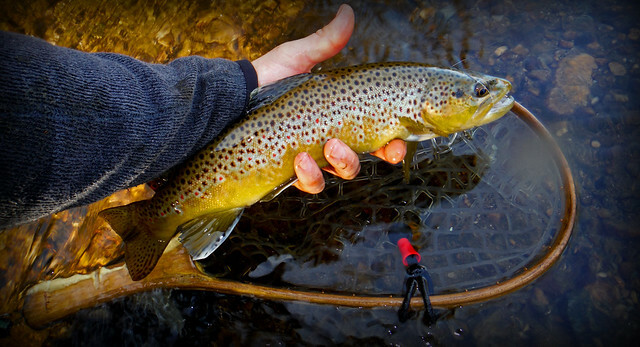 The Gunpowder River is low, flowing at 40 Cfs and is 55 F. Thanks to Stephen Knott for sending in this shot of a beautiful Brown tricked on election day. Tricos, #18 Blue Winged Olive soft hackles and tiny Caddis in the #20 range are still part of the mix. Fly Fishing in low water can be challenging-especially when approaching spooky fish in the flats. With leaves on the trails and frost on the way now is the time to put studs in your wading shoes. Focus on riffles, runs and plan on approaching fish from the banks and covering the log jams and pools with unweighted streamers. Be sure to bring along a camera to capture the last of the fall colors before the polar vortex arrives. Please note: The shop will be open on Veterans Day from 10 till 5. If you are a veteran, please accept our heartfelt thanks and profound appreciation for your service. This entry was posted in fishing report on November 10, 2014 by Theaux Le Gardeur.